Gordon Mah Ung @ PC World sets out and reviews Apple’s iPad Pro. Gordon runs a variety of benchmarks, including BAPCo’s TabletMark V3. A white paper (link) on the benchmark discloses the approach as well as the libraries, compilers and APIs used in the test. The test runs in real time, which can take a few hours on some devices. The benchmark has two performance modules, which give you an idea of how fast the device would be in web browsing and email. 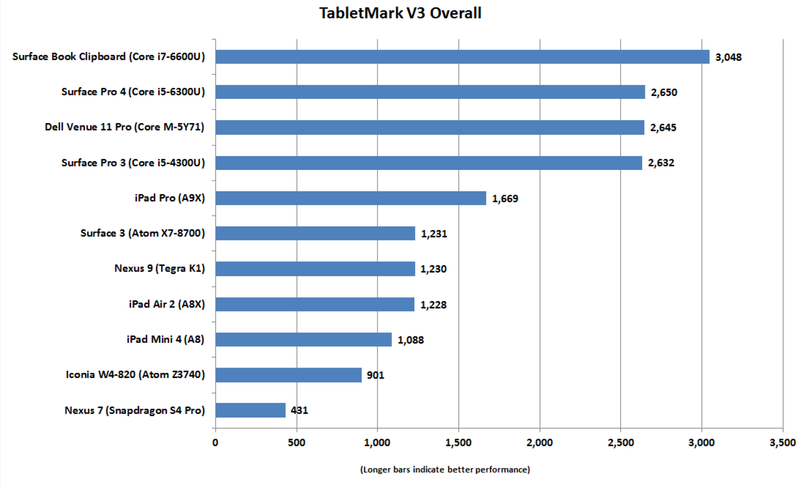 TabletMark V3 also measures photo and video performance, which gives the iPad Pro a healthy lead over the ARM competitors and the Atom X7-Z8700. But the A9X doesn’t come close to the Core i5 or Core i7 devices, or even the Core M.
Head on over to PC World for the full review and benchmark data points here.